VersionEye can watch your projects on GitHub, Bitbucket or Stash and notify you about out-dated dependencies. Most time you don’t work alone on a project. Most time you have other team members who work with you on a project. With the collaboration feature you can add collaborators to your project at VersionEye and they will receive the notification emails as well, just like you do. Just navigate to your project and click the “Collaborators” tab. Here you can start typing the name or username of the user you would like to add. VersionEye will show you some suggestions. By clicking on “Add collaborator” the selected user is added immediately as a collaborator to your project and he/she will receive email notifications to the project. The collaborators receive the email notifications to their primary email address in the same period as the you, the project owner, do. If you would like to add somebody who is not a user at VersionEye yet, you can simply type in an email address and VersionEye will send out an invitation email immediately. Under the menu “Shared with me”. 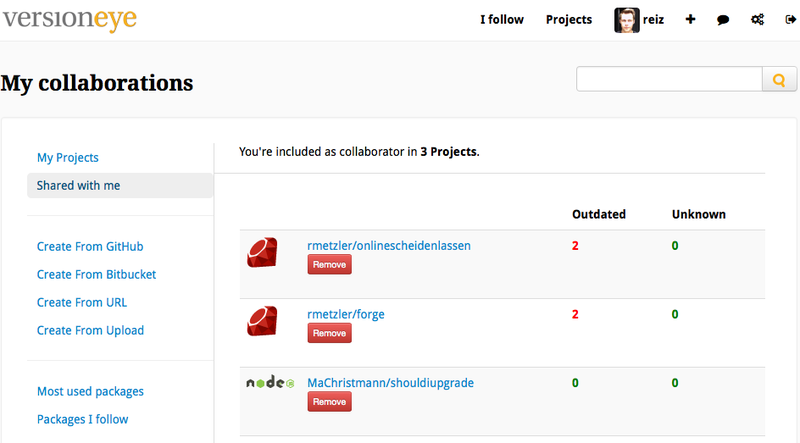 You can see all the projects you are added as a collaborator. If you don’t like to be a collaborator in a project, simply hit the “remove” button to leave the project and you will not receive anymore notification emails to that project. In VersionEye Enterprise there is no “remove” button. That’s a feature 😉 If you don’t want to receive the emails you have to talk to the project owner that he removes you from the list. Let me know how this feature works for you.